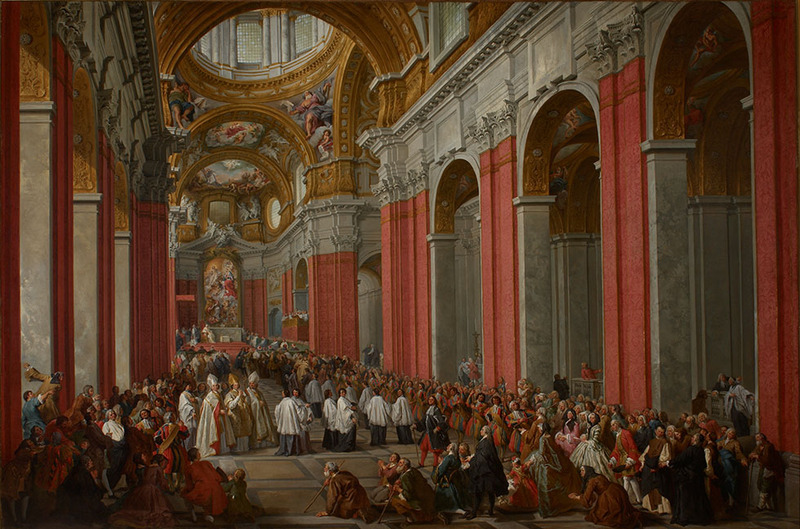 Female Narrator: The scene before us - the consecration of a new archbishop - took place in the church of San Carlo al Corso in Rome in 1743. Just to the left of center, you’ll see three bishops wearing pointed hats called mitres. The man in the golden one is Archbishop Pozzobonelli - he has just been consecrated by the bishops to either side, and by Pope Benedict the Fourteenth. You can find the pope all the way in the background at the high altar, a small, seated figure in white robes. Here’s how an eyewitness described the event.